MYTH 1: A breastfeeding mother has to eat more in order to make enough milk. Not true! 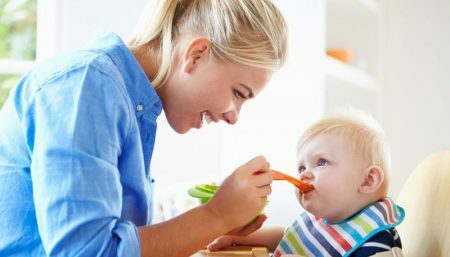 Women on even very low calorie diets usually make enough milk, at least until the mother’s calorie intake becomes critically low for a prolonged period of time. Generally, the baby will get what he needs. Some women worry that if they eat poorly for a few days this also will affect their milk. There is no need for concern. Such variations will not affect milk supply or quality. It is commonly said that women need to eat 500 extra calories a day in order to breastfeed. This is not true. Some women do eat more when they breastfeed, but others do not, and some even eat less, without any harm done to the mother or baby or the milk supply. The mother should eat a balanced diet dictated by her appetite. Rules about eating just make breastfeeding unnecessarily complicated. MYTH 2: I don’t have enough milk . MYTH 3: If the baby has diarrhea or vomiting, the mother should stop breastfeeding. Not true! The best medicine for a baby’s gut infection is breastfeeding. Stop other foods for a short time, but continue breastfeeding. Breast milk is the only fluid your baby requires when he has diarrhea and/or vomiting, except under exceptional circumstances. The push to use “oral rehydrating solutions” is mainly a push by the formula (and oral rehydrating solutions) manufacturers to make even more money. The baby is comforted by the breastfeeding, and the mother is comforted by the baby’s breastfeeding. MYTH 4: If the mother has an infection she should stop breastfeeding. Not true! With very, very few exceptions, the baby will be protected by the mother’s continuing to breastfeed. By the time the mother has fever (or cough, vomiting, diarrhea, rash, etc) she has already given the baby the infection, since she has been infectious for several days before she even knew she was sick. The baby’s best protection against getting the infection is for the mother to continue breastfeeding. If the baby does get sick, he will be less sick if the mother continues breastfeeding. Besides, maybe it was the baby who gave the infection to the mother, but the baby did not show signs of illness because he was breastfeeding. Also, breast infections, including breast abscess, though painful, are not reasons to stop breastfeeding. Indeed, the infection is likely to settle more quickly if the mother continues breastfeeding on the affected side. (Handout #9 You can still breastfeed). MYTH 5: Breastmilk does not contain enough iron for the baby’s needs. MYTH 6: Modern formulas are almost the same as breastmilk. Not true! The same claim was made in 1900 and before. Modern formulas are only superficially similar to breastmilk. Every correction of a deficiency in formulas is advertised as an advance. Fundamentally they are inexact copies based on outdated and incomplete knowledge of what breastmilk is. Formulas contain no antibodies, no living cells, no enzymes, no hormones. They contain much more aluminum, manganese, cadmium and iron than breastmilk. They contain significantly more protein than breastmilk. The proteins and fats are fundamentally different from those in breastmilk. Formulas do not vary from the beginning of the feed to the end of the feed, or from day 1 to day 7 to day 30, or from woman to woman, or from baby to baby… Your breastmilk is made as required to suit your baby. Formulas are made to suit every baby, and thus no baby. Formulas succeed only at making babies grow well, usually, but there is more to breastfeeding than getting the baby to grow quickly. MYTH 7: Poor milk supply is usually caused by stress, fatigue and/or inadequate fluids and food intake. Not True! The most common causes of milk supply problems are infrequent feedings and/or poor latch-on and positioning; both are usually due to inadequate information provided to the breastfeeding mother. Suckling problems on the infant’s part can also impact milk supply negatively. Stress, fatigue or malnutrition are rarely causes of milk supply failure because the body has highly developed survival mechanisms to protect the nursling during times of scarce food supply. MYTH 8: Frequent nursing can lead to postpartum depression. Not True! Postpartum depression is believed to be caused by fluctuating hormones after birth and may be exacerbated by fatigue and lack of social support, though it mostly occurs in women who have a history of problems prior to pregnancy. The nutritional, immunological, emotional and psychological benefits of breastfeeding should be enough to encourage mothers to want to breastfeed their newborn and for all health care providers to strongly encourage breastfeeding. Research has also shown that mothers who breastfeed lower their own incidences of ovarian cancer and pre-menopausal breast cancer, and reduce their risk of bone fractures from osteoporosis later in life.